Valders Stone & Marble , Inc . The photos depict applications of cool building stone. Measurement of radiative properties and calculation of the SRI values were conducted by a CRRC accredited testing facility. The SRI values of this stone greatly exceed the LEED minimum of 29 for hardscaped surfaces. A significant impact of the built environment is the generation of a heat island, an area of increased ambient air temperature due to absorption and release of the sun’s energy by buildings and other manmade structures. Heat islands are most common in urban areas where surfaces are comprised of synthetic materials. In particular, roofing and pavement absorb heat from the sun, especially when their capability to reflect solar radiation is poor. When the absorbed heat is returned to the air (through convection), the resultant raise in temperature can be quite burdensome on air quality, natural resources, and ecosystems. For instance, one of the main ingredients of smog is heata. Temperature raises fuel smog formation, creating visual impairment and health hazards. Additionally, a constituent of smog is ground-level ozone, which can cause short-term or chronic respiratory injury. Heat islands are particularly of concern when the ambient temperature is high, clouds and wind are absent, and the sun sits at a steep angle to the earth’s surface. The sun is most powerful when at its highest point in the sky because incoming radiation strikes (horizontal) surfaces at nearly 90° angles, essentially allowing very little reflection of the heat. Cloud cover can mitigate this intensity, while ambient air temperature only exacerbates heat islands. In effect, both the season and geographic location affect the generation of urban heat islands. The amount of heat absorbed by a building determines the quantity of energy expended by the building’s cooling system. As such, increased absorption results in greater consumption of energy, which requires further energy production and the generation of additional pollutants. Even when a building is cooled by precipitation, the heat transferred to the water can strain ecosystems of the receiving waterbody. Therefore, designing to mitigate the occurrence of heat islands is imperative in reducing the overall environmental footprint of a building. The metric associated with the heat island concept is known as Solar Reflectance Index (SRI). Defined by the Cool Roof Rating Council (CRRC)b, SRI is calculated as “the ratio of the reflected flux to the incident flux.”1 Essentially, it is the ability of a material to reject solar energy. As such, a material’s contribution to a heat island decreases with increasing SRI. Relatively high SRI products are referred to as cool materials, such as cool roofs and cool pavements. Heat islands (and SRI) are often thought to correlate with the color of a material, since lighter colors reflect more of the visual spectrum than darker colors. While color may provide a relative estimate of a material’s ability to generate a heat island, it is not the only determining factor. Two pieces of information are needed to compute the SRI of a material: solar reflectance and thermal emittance. Solar reflectance, or albedo, is the ability of a material to reflect—rather than absorb—energy emitted from the sun. This parameter is measured on a scale from zero to one with values approaching one as reflectance increases. As the shade of a material darkens, its reflectance typically is reduced. However, since color is not always an accurate indicator of solar reflectance, testing is recommended to correctly characterize the attribute. When solar reflectance and thermal emittance are combined, the SRI can be determined. ASTM provides a standard calculating procedure under ASTM E1980 (Roofing Standards). The computation generates a number from 0-100%, with 100% being the most reflective and thus least capable of generating a heat island. a Photochemical smog is a product of the reaction between heat, oxygen, nitrous oxide, and volatile organic compounds, of which the latter two in the United States source predominantly from coal-fired power plants and internal combustion engines (e.g., automobiles), respectively. b The CRRC is an independent, non-profit organization that has established a rating system for radiative properties of roofing materials and maintains a directory of products’ SRI and thermal emissivity that have been validated by CRRC-accredited laboratories. Natural stone has the potential to be a cool roofing or paving material, an attribute with a number of marketable advantages. 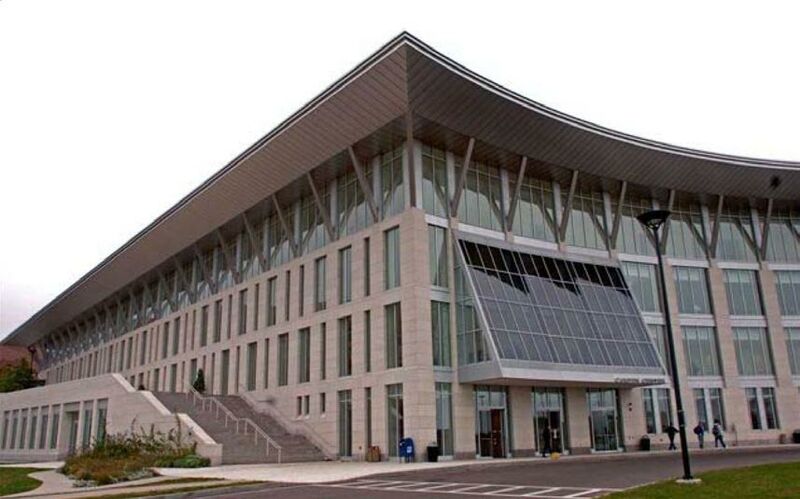 In particular, stone can support reduced energy consumption, decreased utility costs, an improved environmental footprint, and the potential to earn LEED credits. The Natural Stone Council (NSC) advises that any claims of stone being a high SRI product must be substantiated through professional material testing. Natural stone used as a building or landscaping material can decrease the urban heat island effect if the solar reflectance index of the surface is sufficient. Roofing tiles, large decorative pieces, and other stone on a building’s envelope may inhibit energy absorption. Paving or landscaping with stone may also result in similar advantages. Again, material testing should be performed to ascertain this potential. Unlike alternative products, the SRI of only a small quantity of natural stone has been measured; the examples provided at the end of this document confirm values in the area of 0.60. The University of California’s Lawrence Berkeley National Laboratory (LBNL), the leading research group on cool roofing materials, publishes a list of common building materials’ SRI values. Table 1 displays some of those values. Table 1. Radiative properties, temperature rise, and SRI of various building materials as reported in the LBNL Cool Roofing Materials Database. **Average of three light-colored, honed limestones reported from Valder’s Stone & Marble, Inc., who used an accredited CRRC testing facility to evaluate their stone. Temperature Rise is predicted by UT based on the known linear relationship between this variable and SRI. This data is not reported by the LBNL. Products with a high SRI are particularly advantageous in regions that exhibit only short periods of cold weather. In predominantly cold areas, these materials have been shown to contribute to higher heating demands due to an inability to absorb energy from the sun3. Energy savings, however, are still generated during the summer months. In any case, cool materials become increasingly beneficial as the ambient temperature rises. The U.S. Green Building Council’s (USGBC) Leadership in Energy and Environmental Design (LEED) certification program is the preeminent green building rating system in the United States. The program awards credits to construction projects for implementing environmentally-conscious practices during the planning, design, construction, and operation phases of a building’s lifetime. Employing high SRI products is one way of earning a few of these credits. LEED v2.2 as well as LEED v3 provide the opportunity to earn two points for the use of high SRI materials through Sustainable Sites Credits 7.1 (non-roof) and 7.2 (roof). These credits can be achieved in a new building or renovation by installing or replacing a roof or non-roof (i.e., courtyards, parking lots, roads, sidewalks) with a material having sufficient SRI. Credit 7.1 requires at least 50% of the project’s hardscaped area to be constructed of a material with a minimum SRI value of 29. Credit 7.2 requires at least 75% of the roofing material to have a minimum SRI of 78 for low-sloped roofs and minimum 29 for steep-sloped roofs. Alternatively, if a low SRI material is used, a credit can be earned if the weighted average roofing SRI is at least 75. Additional points may be earned for exceeding these criteria under the Innovation in Design (ID) category; contact the USGBC for more information. Contact your local utility company to inquire about potential cool roof rebates in your area, or view the list of rebate programs on the CRRC’s website at https://www.coolroofs.org/resources/rebates-and-codes. High SRI roofs can offer direct energy savings typically between 10-30% for average daily summertime loads as well as peak summertime loads.4,5,6 For instance, a study by the LBNL on three northern California commercial buildings reported that a decrease in solar absorption from 0.20 to 0.60 reduced the temperature of the roof surfaces on hot afternoons by 77ºF (25ºC).7 Another study that observed an Austin, Texas commercial building found that increasing the solar absorption of the roof from 0.05 to 0.83 generated an average savings of $25 per day (or 355kWh per day).8 Other investigations confirm drops in utility bill charges between $10 and $100 m2 of roof surface 9,10 and as energy rates rise, savings only increase. Cool building products may also exhibit an extended useful life as compared to its low-SRI alternatives. Reduced thermal expansion and contraction prevent material degradation, and the smaller quantity of absorbed ultraviolet light slows aging.11 This ability of high-SRI materials to endure lowers the financial obligations and eliminates the environmental impacts caused by repair and replacement of the products over the lifetime of the building. Moreover, stone’s exceptional durability brings additional economic and environmental savings. 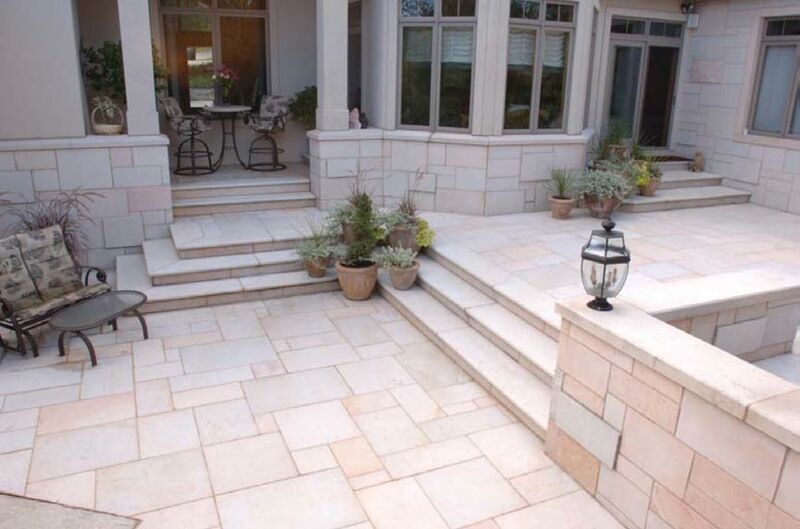 (See the NSC’s case study on the durability of natural stone on the Genuine Stone website at http://www.naturalstonecouncil.org. Natural stone boasts the extra benefit of having an integral finish. An integral finish means that a material contains the same color and structure throughout. This attribute implies that high-SRI stone, unlike some high-SRI alternatives, does not require reflective paints or other coatings; natural stone generally demonstrates the same SRI value throughout the entire slab, tile, or otherwise.c As such, maintenance is generally unnecessary to maintain the desired SRI. c Irregular color patterns and mineral composition may cause different SRI values on each exposed surface; professional material testing is recommended. Solar reflectance index is initially influenced by three factors: material composition, surface texture, and orientation. Over time, SRI may be modified as a result of materials aging, weathering, and discoloration. Exposure to the elements ignites natural processes that may affect a product’s SRI. Air pollutants (e.g., dust, pollen) can cause light colored materials to darken with age, ultimately reducing the ability of the material to reflect sunlight. In fact, it has been estimated that light-colored materials may lose 20% of their reflectance over just a few years if a surface has not been cleaned.17 An increase in energy absorption for aged roofing materials has also been observed18, although because the process of aging is fueled by both UV radiation and material temperature, cool materials degrade relatively slowly as they are more able to avoid warming. The effect of weathering can be evaluated when stone is taken to have its SRI measured, and occasional power washing may help maintain a material’s original value. American Standard Test Methods (ASTM) define the measurement and calculation of solar reflectance (ASTM C1549), emittance (ASTM C1371), and solar reflectance index (ASTM E1980-01). According to the standard test methods, a portable reflectometer and emissiometer are employed to determine the first two, while a prescribed equation merges this information to compute the SRI. This calculation is only applicable to surfaces that are sloped at a maximum of 9.5° from the horizontal. Although testing equipment can be rented or purchased, the NSC recommends that the evaluation of solar reflectance and emissivity are conducted by professional material examiners to maintain credibility of the test results. These services are provided by various material testing companies across the country. Note that the USGBC program requires certification of the test results in order to earn LEED credits, and employing an accredited material examiner may be the best method to ensure that a product’s SRI value is accepted. Expenses incurred from the testing could be included in the price of the material. The CRRC posts a list of accredited facilities that offer SRI measurement. This is available at www.coolroofs.org/product-rating/product-testing. In addition, the CRRC maintains a database of roofing products and their solar reflectance and thermal emittance values. A high solar reflectance index can be a selling point for some natural stone products. This environmentally-preferable property offers reduced energy consumption and costs for a building, mitigation of the heat island effect—particularly in urban areas—and may earn LEED credits for a project. The present focus on sustainable construction and sustainable living is only intensifying, and validating the high SRI values of some stone products is one of the mechanisms that will provide a seat for the natural stone industry in the green building marketplace. dA photon is a discrete bundle (quantum) of electromagnetic radiation; less formally, it can simply be thought of as a packet of energy, the most basic unit of light. Cool Roof Rating Council (CRRC). 2008. Product Rating Program. CRRC-1. Oakland, California. nonresidential Title 24 prescriptive requirements. Energy Policy 33(2): 151-170.
environmental benefits. Building Design and Construction 39(2): 62-64. Performance of the Exterior Envelopes of Building VII. December 6-10, 1998. Akbari, H., Pomerantz, M., and H. Taha. 2001. Cool surfaces and shade trees to reduce energy use and improve air quality in urban areas. Solar Energy 70(3): 295-310. Berdahl, P. and S. Bretz. 1997. Preliminary survey of the solar reflectance of cool roofing materials. Energy and Buildings 25(2): 149-158. Marceau, M.L. and M.G. VanGeem. 2007. Solar Reflectance of Concretes for LEED Sustainable Sites Credit: Head Island Effect Portland Cement Association. PCA R&D Serial No. 2982. Skokie, Illinois. Akbari, H., Bretz, S. and A. Rosenfeld. 1998. Practical issues for using solar-reflective materials to mitigate urban heat islands. Atmospheric Environment 32(1): 95-101. Akbari, H., Berhe, A.A., Levinson, R., Delgado, A.H. and R.M. Paroli. 2005. Aging and Weathering of Cool Roofing Membranes. Office of Scientific and Technical Information. US Department of Energy. https://www.osti.gov/biblio/860745. 1Berdahl, P., Akbari, H. and L.S. Rose. 2002. Aging of reflective roofs: soot deposition. Prepared By The University of Tennessee Center for Clean Products.